Summer is around the corner and it’s time to make some space in your wardrobe for clothes that will go perfectly with your favourite pair of flip flops! 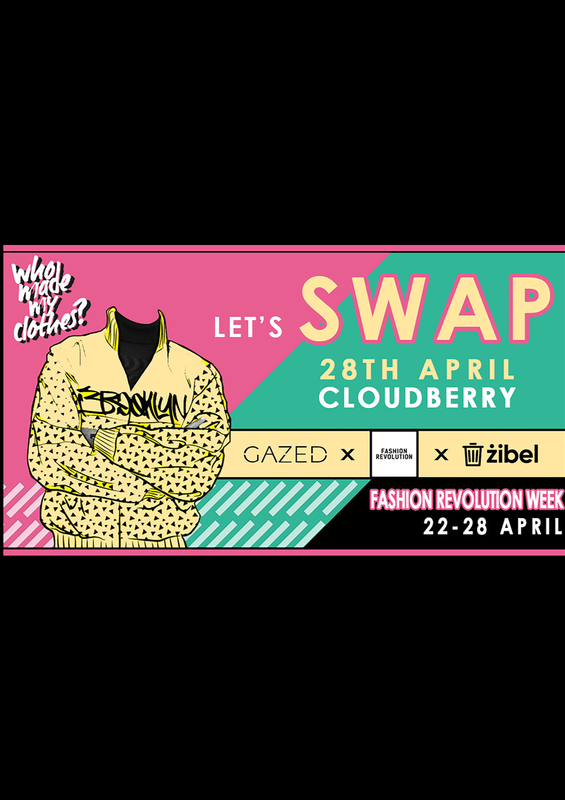 Together with GAZED and Fashion Revolution we want to invite you to SWAP, an opportunity for guilt-free shopping that also serves the environment! We all have those clothes that for some reason we haven’t worn in the past year or just simply fell out of love with. What if you could exchange those clothes for something new without losing a cent? Here’s where the SWAP comes in handy! So how & what do you need to do? It’s easy! Spare a few hours in your hectic day and dig around your closet. Find items that you no longer use but are still in good shape and deserved to be loved once again. Prepare them for a new life with a new owner - wash and repair any damages, etc.. Lastly, book the 28th April and join us for a SWAP party at Cloudberry Sliema. Voila! You’re all set! Clothes: Jackets, Sweatshirts/Hoodies, Tops, T-Shirts, Pants, Leggings, Shorts, Skirts, Dresses. Accessories: Shoes, Hats, Caps, Scarfs, Belts, Bags, Backpacks. - Free glass of prosecco for every Swapper! - Exhibition hosted by Gazed x Fashion Revolution. 1. Participants can bring 1 to 15 items. 2. Every item has the same value on the event 1 item = 1 token. 3. All the items should be washed and in good condition. 4. Remember to carefully select the clothes to swap, once you exchange them for tokens - they don’t belong to you. Make sure to say a proper goodbye as all the leftover clothes will be donated to an NGO. 5. If it turns out you have more clothes than expected and still want to pass them on, a separate collection box for donations will be on site. 6. There will be a free glass of prosecco for every swapper at the entrance (because we care). 7. Make sure to arrive between 2-3 P.M - It takes time to exchange clothes for tokens and prep everything. You can use this time to go ‘window shopping’ and plan your hunt (and don’t miss your free glass of Prosecco). 8. SWAP TIME! Between 3 PM and 6 PM. The concept of the SWAP is to introduce swapping clothes as part of a more conscious way to consume fashion. You as a consumer should be aware of what you buy, from whom you buy it and who ultimately made your clothes.